Would the process take as long as past referendums? The UK has held five referendums under the terms of PPERA, three of which were enabled directly by UK primary legislation – the 2004 North East Assembly referendum, 2011 Alternative Vote referendum and 2016 EU referendum. As the graph below shows, all had fairly long timetables: the shortest was the AV referendum, which took nine months from the introduction of legislation to polling day. In the absence of urgency, however, many of the steps leading to these referendums took longer than is strictly necessary. Starting with the legislation, both the European Union Referendum Act 2015 and the Parliamentary Voting System and Constituencies (PVSC) Act 2011, which enabled the AV referendum, took just under seven months to pass. But in both cases this period included the long summer recess. The PVSC was also a complex bill that faced significant political obstacles, slowing its passage. Besides providing for a referendum, it set out the full details of the proposed new voting system, as well as controversial changes to parliamentary constituencies. A streamlined referendum bill could move more speedily, particularly if there is political will. Passage of the legislation enabling the 2004 referendum took only five months, again subject to no particular pressures of urgency. In terms of the gap between royal assent and polling day, the North East poll took by far the longest, at one year. In line with the Electoral Commission’s preferred timetable, six months elapsed between the passage of the EU referendum bill and the date of the 2016 poll. But the 11-week period between royal assent and the AV referendum demonstrates that a shorter timescale is achievable. This suggests that a further Brexit referendum could be held on a shorter timetable than applied to past referendums, should the situation require it. The question is: by how much could each process be compressed without harming the integrity of the vote? What is the minimum time in which legislation could be passed? 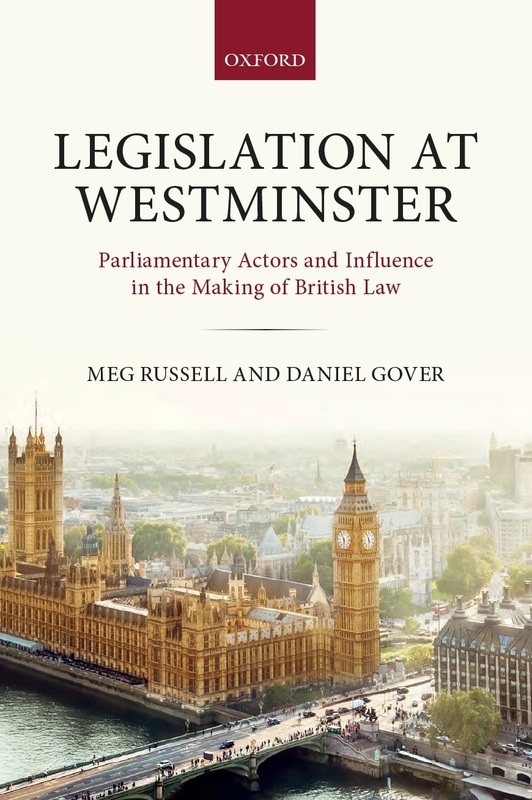 Political considerations rather than procedural constraints are likely to dictate the minimum time in which legislation could pass through parliament. The government’s narrow majority, dependent on DUP support and subject to internal party divisions, makes the situation highly unpredictable. The key factor would be the extent of cross-party agreement that emerged over the need for a second referendum – particularly the government’s own position and that of the Labour front bench. 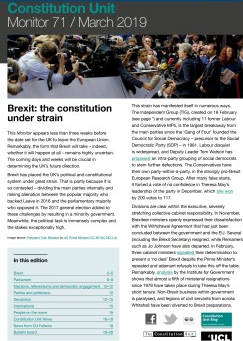 Tricky aspects such as the franchise, the referendum question and the regulatory framework would certainly need to be debated and scrutinised to ensure that the referendum commanded legitimacy; but whether they were contested and delayed would depend on the politics of the moment. The EU Referendum Bill, for example, was delayed by ‘ping pong’ between the Commons and the Lords over whether the franchise should be extended to those aged 16 or 17. With political will, legislation can be rushed through on significantly reduced timescales. In 2005 the controversial Prevention of Terrorism Act (PTA) 2005 received royal assent within three weeks of its introduction, despite being subject to fierce ping pong between the two chambers. In the Commons the key step is agreement of the programme motion, which can prevent a minority of dissenters delaying the process. Meanwhile the Lords, which is more pro-EU than the Commons, might well wish to facilitate a referendum if the Commons wanted it, so long as the arrangements were constitutionally sound. Part of this judgement might relate to the Electoral Commission’s approval of the question proposed in a referendum bill. This assessment process could constrain the speed with which legislation could be passed. What is the minimum time for question testing? PPERA requires the Electoral Commission to assess any referendum question set out in a bill. 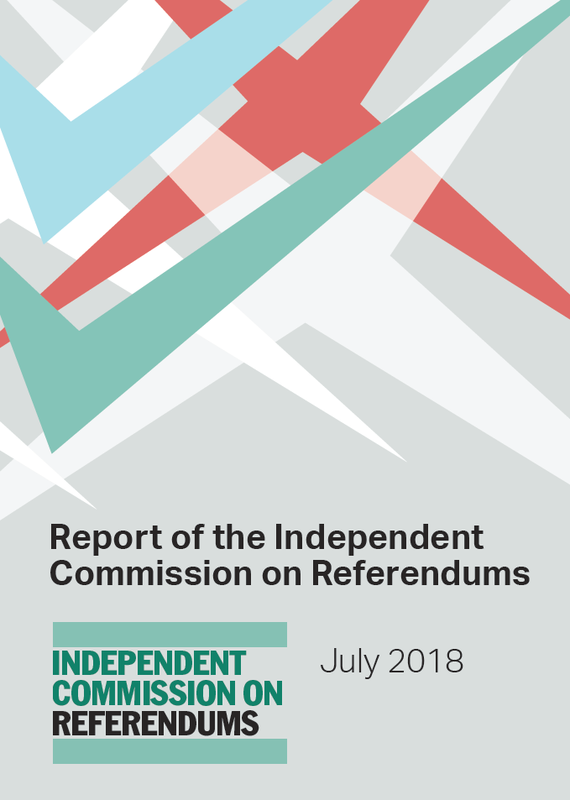 The Commission does so by conducting qualitative research with the public and consultations with prospective referendum campaigners and others to ensure the question is not ambiguous, misleading or biased. At the end of this process, the Commission either states its approval of the existing wording or proposes alternatives. Normally parliament then decides whether to amend the question on the basis of this recommendation, so it is important that the recommendation is made when the bill is still amendable. But question testing usually takes 12 weeks. Given the tight timescale in this case, parliament could decide to pass legislation without waiting for the Commission’s opinion. Alternatively, the Commission, which is at liberty to consider the wording ‘in such a manner as they may determine’, could conduct a very basic assessment in a matter of days. 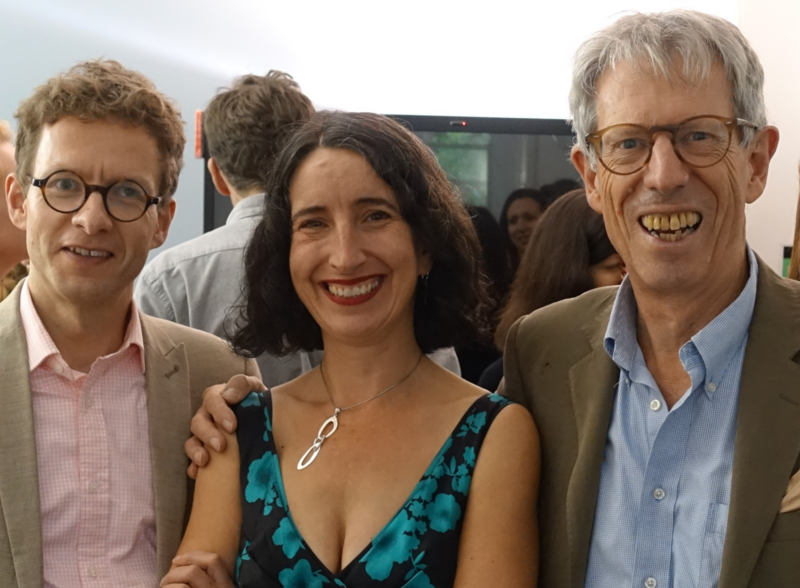 In a polarised political environment, however, the perceived legitimacy of the referendum result requires public confidence in the neutrality and intelligibility of the question. Curtailing or abandoning the normal process could jeopardise this. Furthermore, there is a possibility that the referendum question could take a form not previously used in the UK, which would necessitate particularly careful testing. Therefore, it is likely that something similar to the usual process, albeit perhaps on a somewhat condensed timetable, will be necessary. What is the minimum time between legislation and polling day? Shortening the four-week application period for campaigners would allow campaign groups little time to organise, particularly as the options in the referendum may become clear only late in the legislative process, hindering prior organisation. If there is more than one suitable applicant to be lead campaigner for one outcome, it would be difficult for the Electoral Commission to designate in less than two weeks. This choice is unavoidably controversial, and subject to potential judicial review. It must be made in a demonstrably fair and rigorous manner. The final four-week period during which lead campaigners may utilise the benefits of designation is widely seen as too short and is usually extended for this reason. Shortening the period below four weeks would allow very little time for campaigners to make their case to the public, and such a departure from past practice could undermine the legitimacy of the vote. As noted above, the Electoral Commission recommends that the period between legislating for a referendum and polling day should be considerably longer than the minimum 10-week regulated period. This reflects the need to complete a range of administrative and regulatory tasks before a referendum can take place. For example, polling stations must be organised, ballot papers printed, guidance for Chief Counting Officers and referendum campaigners produced, and voter information booklets circulated. Nonetheless a general election necessitates most of the same tasks as a referendum, and in 2017 such an election was held just over seven weeks after it was announced. Truncating the timetable to roughly the 10-week campaign period seems possible, at least if the rules for the referendum are largely the same as in previous votes. But significant rule changes, or an innovative format such as a multi-option question, would increase pressure to allow more time. So, is there enough time? There are clearly many uncertainties in the timescales discussed above. The biggest one is the timing of the legislation, which is greatly dependent on politics. If both the government and the opposition were to throw their support behind calls for a referendum a swift legislative process is possible – though it would be important that key aspects of the bill were seen to be scrutinised adequately. This process must, however, accommodate the Electoral Commission’s testing. If that could be curtailed to around eight weeks, the bill might be approved within say 11 sitting weeks – though an additional fortnight would be likely taken up with the Christmas recess. Allowing one week between passage of legislation and the start of the regulated campaign, and a 10-week regulated campaign period, would take the total period from start to finish to 24 weeks. This implies that, were legislation introduced the day parliament returned from the party conference recess, on 9 October, the earliest Thursday on which a referendum could be held would be 28 March – the very day before exit day. Of course, the introduction of legislation so soon is very unlikely, and there is plenty of scope for delays along the way. Hence, to hold a referendum, Article 50 would almost certainly need to be extended and exit day postponed. This is certainly legally possible. Whether it is also politically feasible is widely discussed and is a matter that we will return to in a future post. 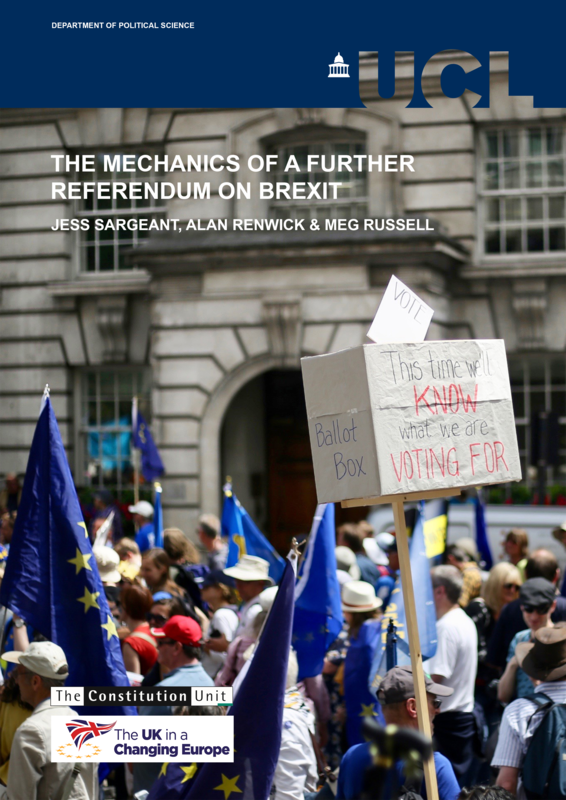 This is the second in a series of posts on ‘The Mechanics of a Further Referendum on Brexit’. Further blogs on this topic will be added in the coming weeks: to see all posts in the series, visit our project page. Jess Sargeant is a Research Assistant at the Constitution Unit. This entry was posted in Brexit, Elections and referendums, Europe and tagged 2004 North East Assembly referendum, 2011 Alternative Vote referendum, 2016 EU referendum, Alan Renwick, Brexit, Brexit referendum, Electoral Commission, European Union Referendum Act 2015, Jess Sargeant, meg russell, Parliamentary Voting System and Constituencies Act, People's Vote, Political Parties Elections and Referendums Act, PPERA, second Brexit referendum, second referendum. Bookmark the permalink. The absence of any sort of political context produces a nonsense. For a political situation to develop in the near future in which this Parliament might initiate referendum legislation you have to postulate a situation in which the current Government becomes a convert to the idea. That isn’t just highly unlikely it is total fantasy. As important, although many supporters of a referendum probably privately simply want an opportunity to reverse the previous referendum, most publicly proclaim that want a referendum ‘when the future relationship between the UK and the EU is known..Leaving aside the legal and political reality that won’t be until well into the 2020s, there is no question now of our knowing anything at all before well into November. In the present circumstance it would be near impossible to formulate a meaningful question.